Dive through the sky with the majestic Fierce Flyer! Flap the powerful moving wings! Pose the tail feathers and grip with the articulated talons! Build the ultimate bird of prey! Rebuild it into a venomous scorpion with a flexible stinger tail and moving mouth pincers or a beaver with poseable tail, feet and arms…. Dive through the sky with the majestic Fierce Flyer. Flap the powerful moving wings. Pose the tail feathers and grip with the articulated talons. Build the ultimate bird of prey. Rebuild it into a venomous scorpion with a flexible stinger tail and moving mouth pincers or a beaver with pose able tail, feet and arms. This toy costs approximately £9.99 (for the latest and best prices make sure you check our retailer list for the LEGO Creator Fierce Flyer 31004 above). 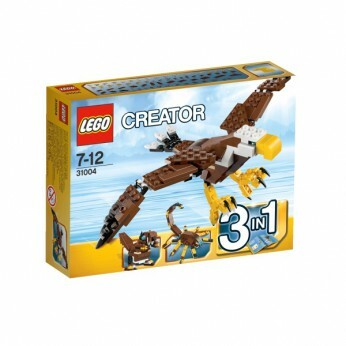 In our review of LEGO Creator Fierce Flyer 31004 we classed it as being suitable for ages 6 years, 7 years, 8 years, 9 years, over 10 years but recommend you check the manufacturer specific advice before purchasing.